I told some friends last night that when I listed this packet, I felt like somebody needed to give me a t-shirt. Or a cookie. It's designed to help 1st-3rd grade teachers review, introduce and extend the comma conventions listed in the Common Core. I started to make this pack exclusively for 3rd grade, but I found my students needed a BIG refresher on the standards now listed for 1st and 2nd grade as well. 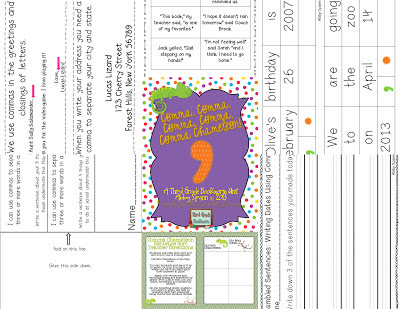 CCSS.ELA-Literacy.L.3.2b Use commas in addresses. CCSS.ELA-Literacy.L.3.2c Use commas and quotation marks in dialogue. CCSS.ELA-Literacy.L.1.2c Use commas in dates and to separate single words in a series. Cards that list the standard and provide an example for students. I used these to create my charts as needed. I put the standard and example card at the top, and then we brainstormed additional examples together in a shared/interactive writing setting. This was key for my teammates and I - it gave us the flexibility to review and reinforce what we needed to teach individually. Flipbooks are included for each standard! For standards that list more than one skill, I've broken it up into separate flipbooks. For example, you'll find one flipbook for using commas in dates and a second flipbook for separating single words in a series. Again, these are broken into sections by grade level standards and for standards that list more than one skill, the sentences are separated. We used this as a "Scoot" game. Students worked together to unscramble the word and punctuation cards and create the sentence correctly. When they were given the OK, they recorded their work on an answer sheet. I only asked my kids to do this 3 times - you can always run off the recording sheet back-to-back and have them list every sentence. You can also put the sentence scramble cards in a center or have them play a relay-race game in groups of 3-5. Once again, each activity is repeated according to grade level standards. Students can work independently or with a partner to look at 6 cards. They have to sort them on to a mat labeled "Correct Chameleon" or "No Way Newt." After sorting, they choose one of the cards to write correctly on a recording sheet and come up with an additional example on their own. I also managed to squeak out a Spring version of Apply the Adjective before I crashed last night. How about a BOGO deal instead? For any item you purchase from my store during today's sale, you can pick one our free (of equal or lesser value). Just purchase your more expensive item on TpT and then receive your free item via email. DON'T put the free item in your cart on TpT!! Instead, send me an email with your TpT username (so I can verify your purchase) and the name of the free item from my store that you'd like.